Welcome to the moody blues. 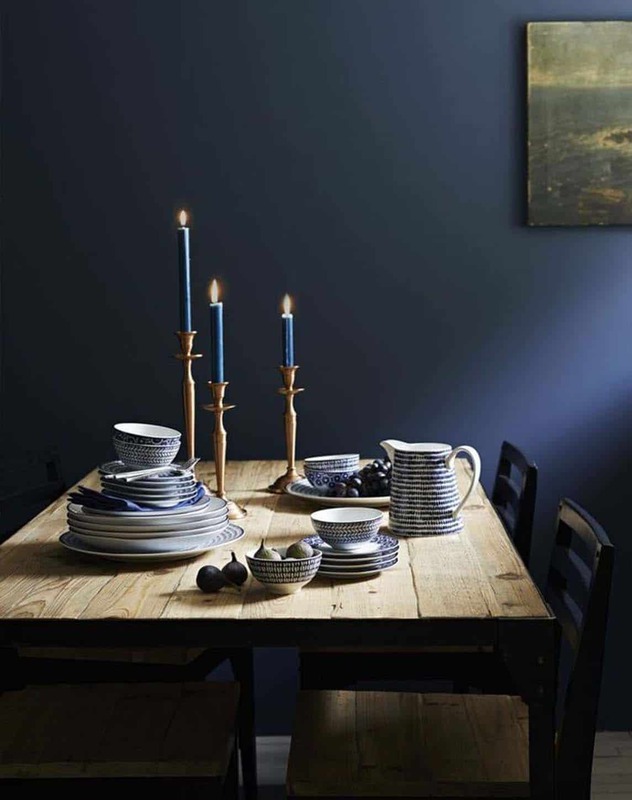 Not bright blues or light blues but deep, dark, rich blues – with a touch of gold. 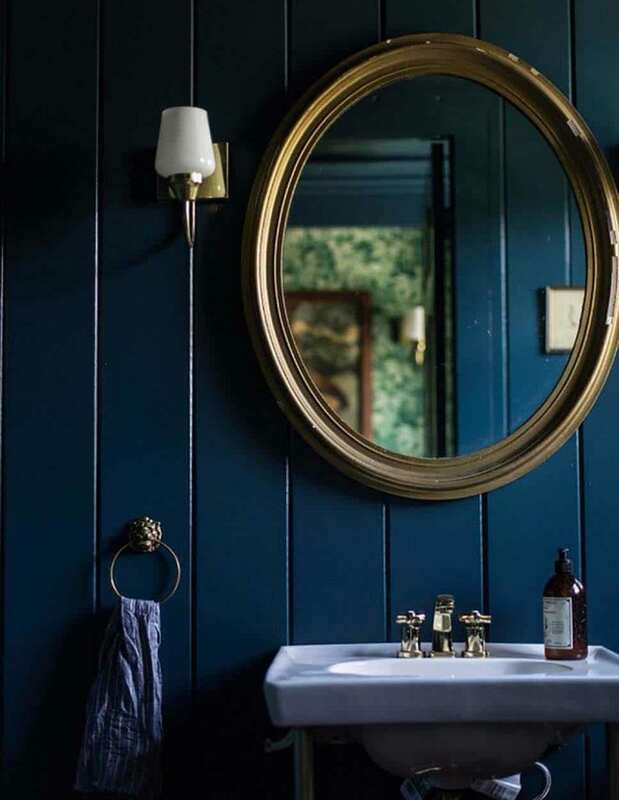 It’s all part of our new found love of dark walls that make colour ping out and create atmosphere. That’s why gold works so well with dark blue walls. 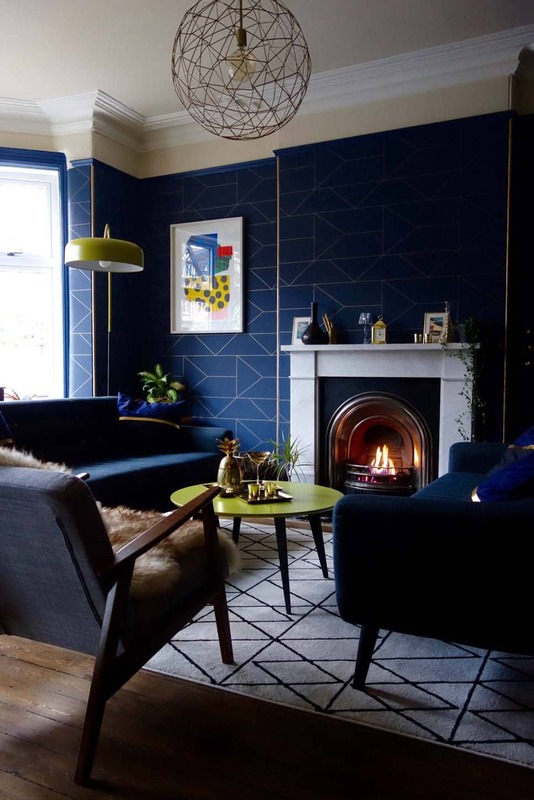 It creates an elegant, sophisticated feel that is right on trend – blue and gold interiors. 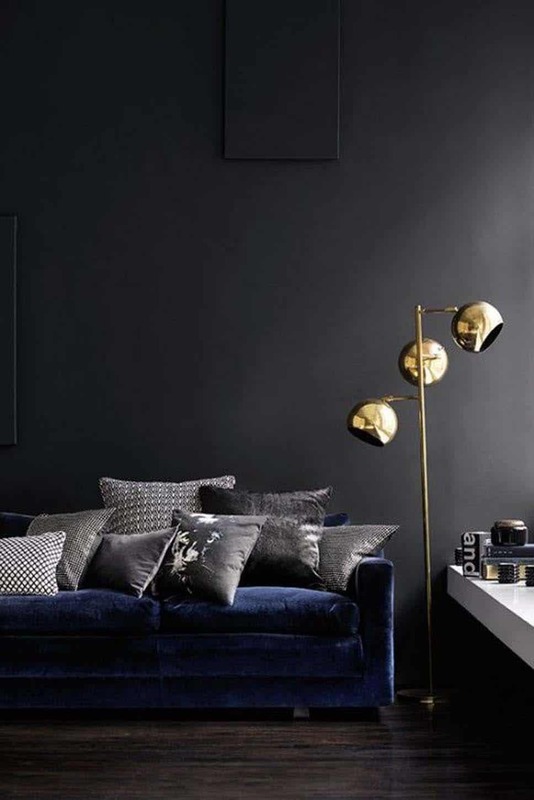 We love this dark blue and gold lounge. The panelled walls are divine, giving extra detail to the painted wall and creating interesting shadows and highlights. The fireplace painted to match the wall colour retains the grandeur but removes the visual clutter, strengthening colour palette. The gold mirror is beautiful too! A real focal point. 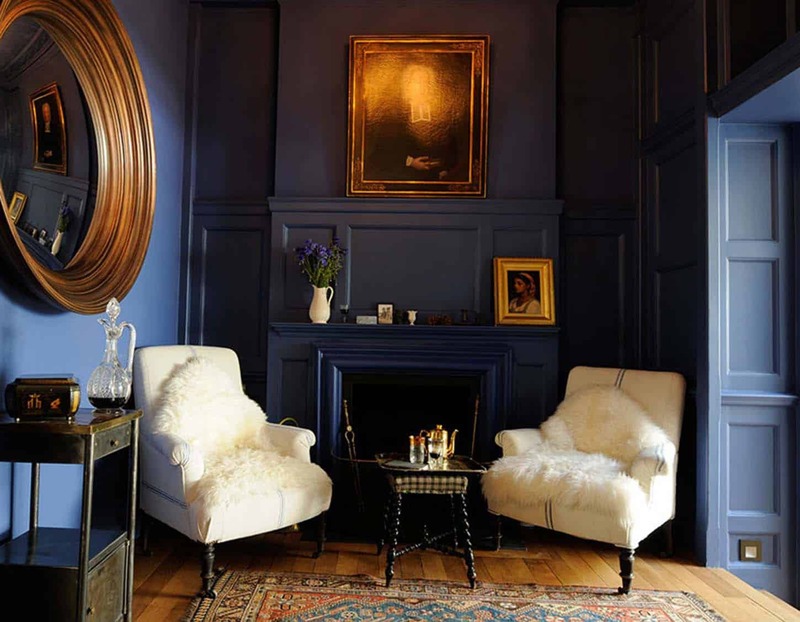 Dark blues walls can be used to create both traditional and modern feels. Golds work so naturally as a highlight through lighting and accessories. For a more modern tone you can use yellow in place of golds to add a pop of colour. The lounge below by Making Spaces’ Karen Knox, ties gold and yellow through accessories and accents. 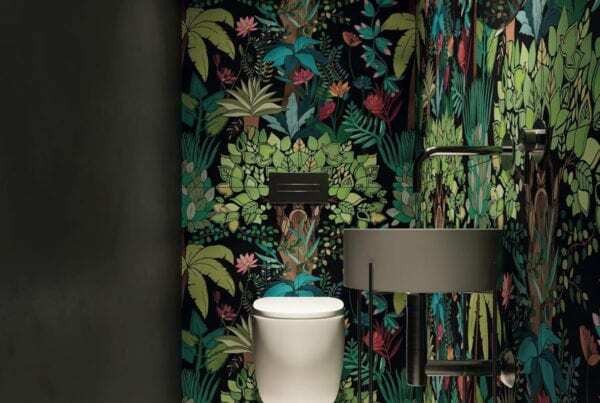 The wallpaper has a keyline gold pattern, just enough to have impact but not too much to over complicate. The yellow floor lamp and table pop out and the similar tones draw your eye to the artwork on the wall. Used minimally, gold creates a luxurious feel without being to flashy or ostentatious. Used in accent, the eye is drawn to the gold, which warms the moody blue walls. Love this! Adding a touch of white allows the colour scheme to work without creating too dark a space. In the kitchen below, the white create a fresh, clean feel perfect for a kitchen, whilst the blue and gold creates an elegant, refined feel. 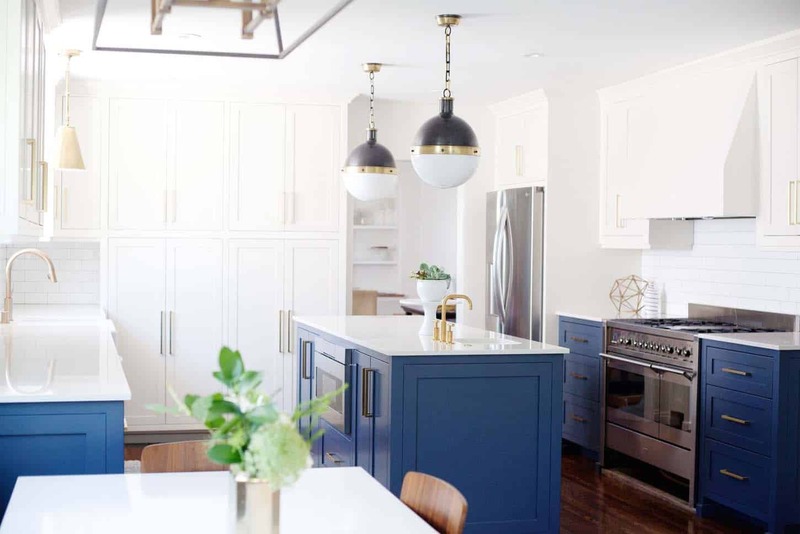 By using blue on the base units only the room doesn’t feel too busy, your eye is drawn to the key working spaces of the kitchen. 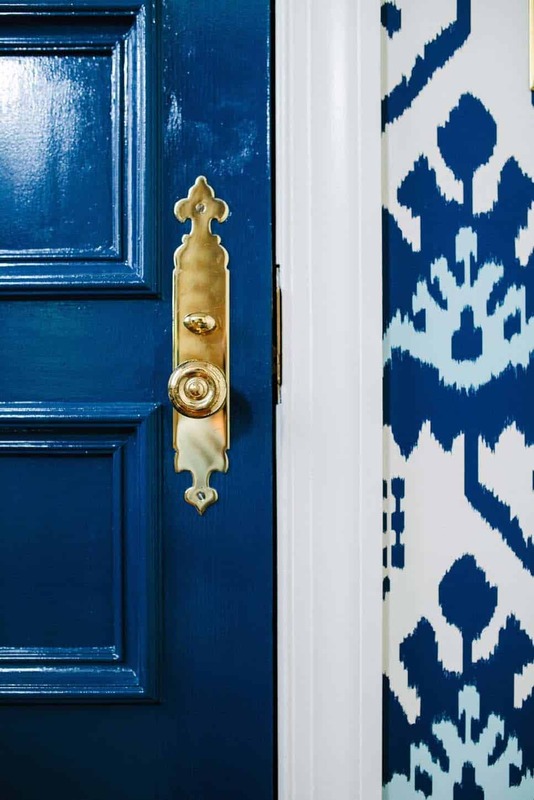 We love a blue door with gold furniture. This lovely door has been painted to match the blue in the wallpaper which gives the scheme a really pleasing feel. White isn’t the only neutral colour that works with this scheme. A dark grey actually work really well with blue and gold. It doesn’t sound like it might, but it actually gives a great contrast to the blue, making it feel brighter. The gold is the seal between the two, a common complimentary colour to tie it all together and add warmth.